Travel through the Namibian countryside on a three-day safari to Sossusvlie. Drive through the Eros and Khomas Hochland mountains on the way to your camp. 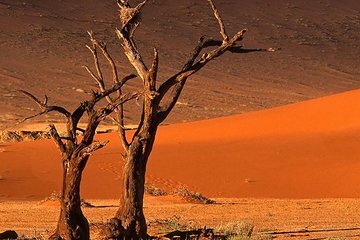 The next day, wake early to explore the Sossusvlei Dunes area, making sure to watch for jackals, ostriches, antelopes, and other wildlife. Stops at Dune 45 (where you can climb to the top of the dune) and Sesriem Canyon are also on the route.